As many historic homes as there are in Atlanta, many are surprised to find historic dwellings inside the Millennium Gate. In fact, the Millennium Gate is home to three historic rooms from three different homes. That's right. That great big giant arch in Atlantic Station is also a museum...and they offer tours. Their space is also available for corporate events and weddings (and it has great views of Atlanta!). 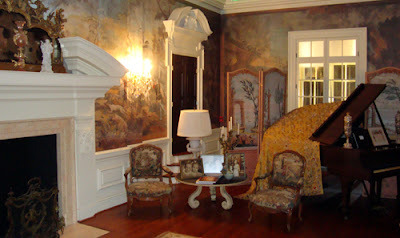 The room in this photo, the Rhodes-Robinson Room, is from the Pink House (also called the "Pink Palace"). And while you're in the neighborhood, consider taking in "Bodies: The Exhibition" or "Dialog in the Dark." Looks like one gorgeous room! I am due for an Atlanta visit....havne't been in ages..and it seems to be the domain of many a beautiful home and it seems like everytime I am drooling over something, its....whereelse, but Atlanta! I am going to have to google this spot to see more.....looks intriguing! Found you through Arch.Tourist, we are both on his blogroll...please visit me, newish to blogworld, under 2 months.....started a blog about the building of our new home and my passion for fine decor/design. I'm so glad you've visited. I went to an event there and it knocked me out. The longer I was there the more I enjoyed it. Standing in the lawn takes me to another place. It is a magic place at sunset. Here is my blog about the event with Rob Krier and Dhiru Thadaniat at the Gate.